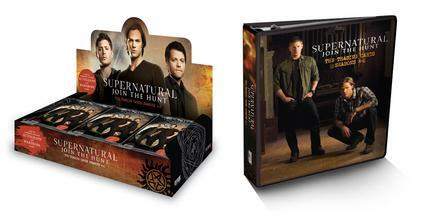 From Cryptozoic Entertainment comes the next Supernatural release for Seasons 4 through 6. This great full-color 1" padded binder will hold the latest set safely and in style and includes an exclusive card only available when you buy the binder. Also, order 24-pack boxes of the new release, which feature a 72-card base set as well as randomly inserted chase, autograph and costume cards from the show. (Though pictured, the box must be ordered seperately).